Flipkart recently announced The Big Billion Day sale on 13th to 17th October 2015 as an equivalent to the Black Friday sale in the USA. 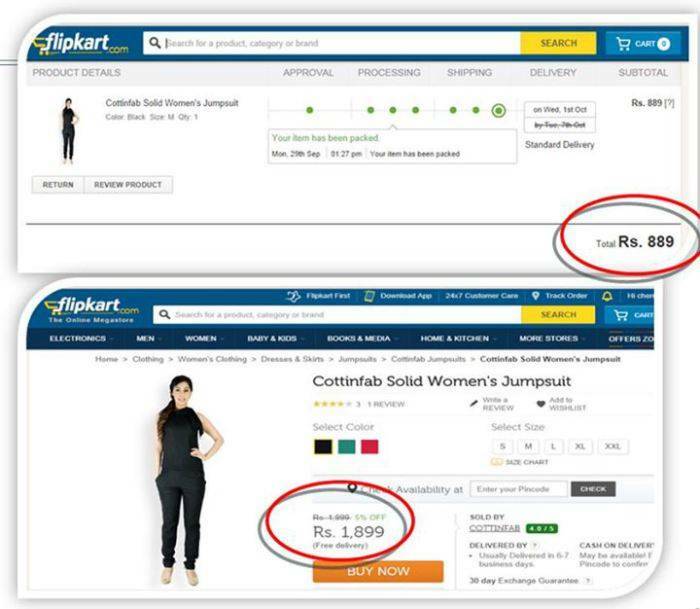 Let me remind you about flipkart big billion day on 6th october 2014 . Flipkart ever since it was launched as full fledged e-commerce portal and Flipkart claimed that it was the giant sale ever in the history of eCommerce in India. However, people found it rather strange and smells rat in it. Flipkart might have underrated and underestimated its customers of their intelligence and shopping techniques as lot of people who use to buy things online uses tools and plugins to track the prices for x days and can also compare the prices of particular commodity available on difference e-commerce stores. Online tools such as Pricify and Chrome extensions like flipshope provide users to monitor/track prices of any product for n-number of days and compare prices of same brand products on different e-stores. Cherry Parekh, one of a Flipkart customer bought a dress worth Rs 899 this week (see shipment details in image below) and on big billion day she was shocked to see the rate which was increased to Rs 1899, which on the sale day might again be Rs 899. What to do this big billionday to not become victim of price scam ? It will show you daily price variation on each site each day . It is important for us as consumers to be aware about such marketing gimmicks and take purchasing decision wisely after considering all the factors. Flipkart Big Billion Days 2016 are going to start soon with all new exciting deals and offers. actually these blunders are because of three reasons..
1. Miss communication between technical and category team. 2. Sellers wants to showcase their prices at a lower rate (despite the fact that they are actually the same). There r talking about last years sale man!! It was on 6th October 2014. Cant help this time. The flipkart BBD is app only. Installing the extension wont help. Possible that the discount could be seen only on the app. This will help only at times where the price has been slashed.